Sign-up to SaleCycle's monthly newsletter. Zeta Global is a data-driven marketing technology company that helps brands acquire more customers, keep the ones they have for longer and grow their value. Their ZetaCRM platform allows clients access to a multichannel marketing solution that unifies and unlocks data to drive return on investment. By producing personalized insightful conversations with customers that are delivered in real-time with precision, ZetaCRM is a powerful tool for brands to use. With our direct integration with Zeta Global, SaleCycle is able to dispatch rich, contextual emails in-line with your other email marketing efforts. 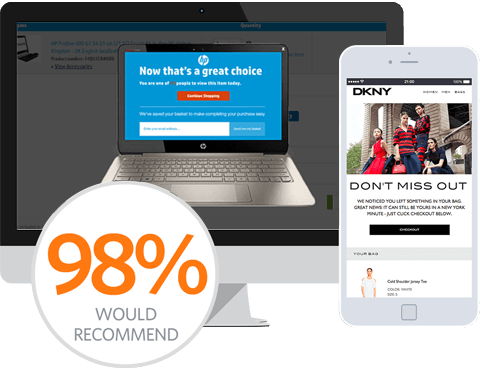 This ensures our client’s customers receive the most relevant message at the exact moment they are making their purchasing decisions. As we can directly integrate with Zeta Global, all client’s emails are one to one triggered so they are both relevant and timely, ensuring emails convert and are optimized to their full potential. Integrated Setup, deployment, optimization and reporting. Ability to deliver a fully personaized multi-channel campaign that engages your on-the-go customers. Together our technology enables access to core of CRM efforts. Peerless Performance. Powered by Data.